I welcome all the users of the uwow.biz project again. In this article we will have a look again at the Blizzard’s secrets and at the locations the players didn’t get access to. In the previous article I told you about the places which were situated in the world and to which, at a very strong desire, it was possible to get to. Now, I will talk about the places which are fully isolated and independent. And I would like to begin with two unfinished battlegrounds. In fact, everything is much greater. The Alliance Base and The Horde Base have slightly something to do with the Isle of Conquest and perhaps there were supposed to be the bosses which had to be killed to win the battle. Across the battleground there are a lot of caves and various camps. Perhaps, the capture of these bases could bring some advantage, whether some points or the possible number of deaths (just like at the Alterac Valley), or perhaps the kill of the inhabitants gave a possibility to join them to your army (just like in the Heroes of the Storm). The entrance to the neutral territory is guarded by two dragons. There are a lot of temples, shrines and wells behind them. But the main part is occupied by the huge temple, exactly the same as in Darnassus but only its dark version. Apparently, there had to be some kind of goddess bestowing her blessing to braves or maybe this temple had some other purposes… Alas, we won’t know it. Overall this place makes a good impression, causing interest and the thirst to explore it fully. Because of a good elaboration this place was chosen as a location for the «Ghost town» event which, I think, successfully fit into these decorations. Three lines as well, some places for camps, shrines or bosses. 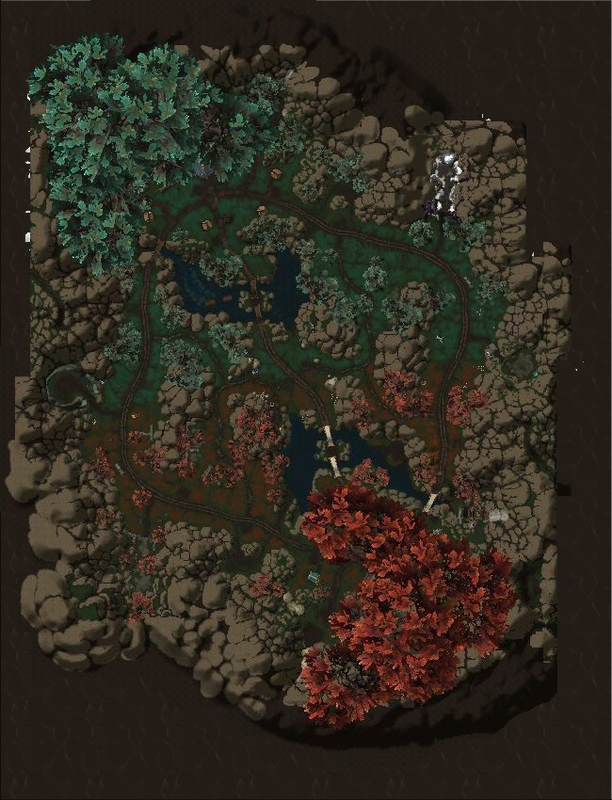 With regard to this place, there are a lot of opinions that the similarity with Dota won’t stop at the resemblance of the maps. There will be independent creatures running along the lines and fighting each other and also the main target will be to destroy the core/main building. But these are only opinions and now we can only assume that this is an alternative version of Deepwind Gorge or unfinished by the time of release location. It remains to be seen. Another well-known location will be Emerald Dream. According to the idea this is an «alternative version of the Azeroth» and it could appear at the time of the Burning Crusade but the release «primacy» received Outland and this location remained «hidden». However, there is nothing to speak about since almost everything is green here. The location is separated into several parts: these trees, green fields with enormous flowers, funny signs of the designers, curlicues on the field and a huge amount of the green mountains with the place,which looks like the entrance to this location. Perhaps, there is nothing interesting except for that. 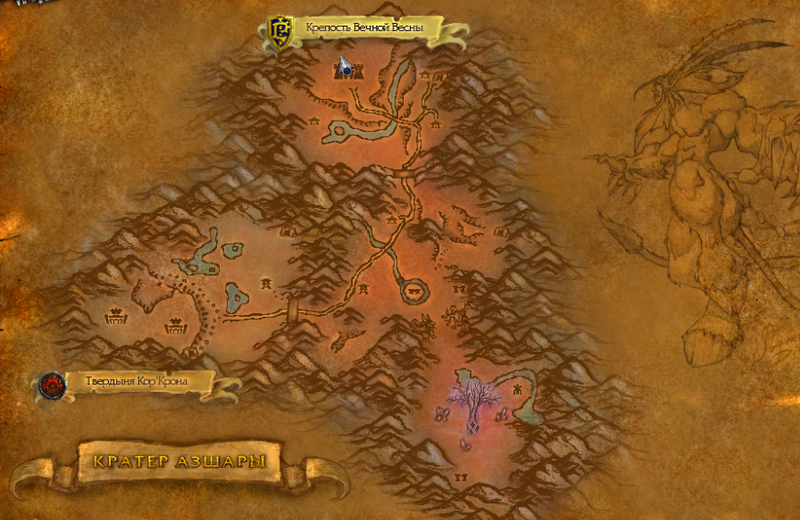 This location, I suppose, was created as a new continent or as a huge raid for 40 players. As Blizzard developers said they would enter this zone to the World of Warcraft Legion expansion set. Let’s see what will happen. I hope it was interesting for you, dear players, to learn about the places which Blizzard creates but keeps hidden from our eyes.